This release is a minor update that makes loading tile sets a lot easier and fixes some under the hood bugs with regards to material setup. A texture setup bug was reported on the forum (thanks zer-o) and I decided to take the opportunity to simplify loading and adding tilesets to your scene. Instead of going through the material and texture tabs, loading tilesets is now a one click process. 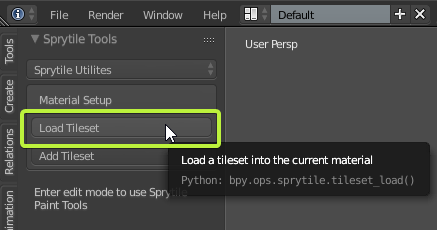 You can update Sprytile through the update system in the user preferences or manage the update manually. I'd also like to encourage people to take part in the Discord server weekly challenges. This week the theme was: console. For the challenge I built a little Casio Loopy, an obscure game console targeted at girls that could print out little stickers. h/t to the Femicom Museum megathread for making me aware of this cute little console. If Sprytile has been useful for you, please consider giving it your support by making a donation on the itch.io page or by giving Sprytile an honest rating. I appreciate all your help!